These muffins are totally delicious and moist! The recipe calls for 2 cups of chopped strawberries, and that alone will make your kitchen smell like strawberry heaven! I have always loved strawberries. When I was little my grandmother used to take us “berry” picking, nothing better than fresh picked berries. They are not only sweet and delicious but so good for you. They are full of anti oxidants which help fight free radicals. They help prevent cancers, wrinkles, fight against disorders like asthma and atherosclerosis. What I also like about these beauties is that in one cup they only contain 43 calories! You would never know since they are so sweet and delicious. I sampled these muffins personally. They were light and delicious. 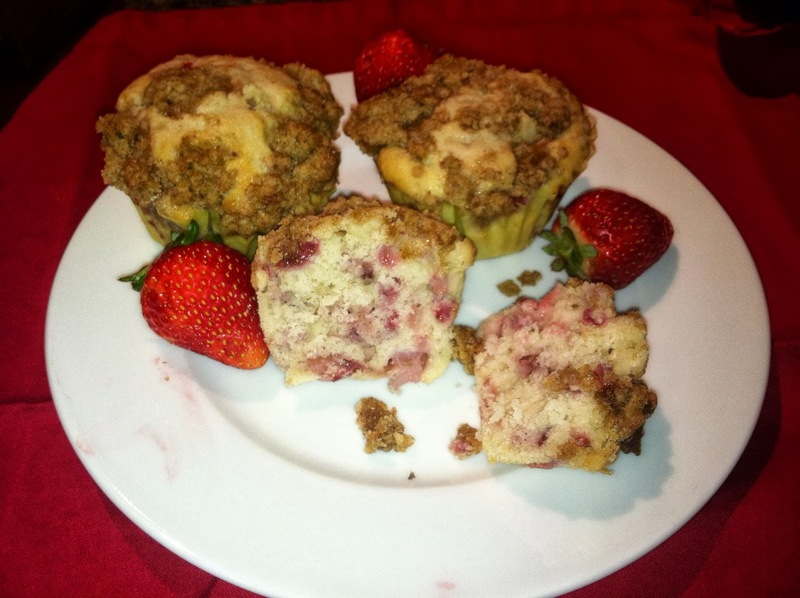 The taste was not overpoweringly sweet, the topping was a nice addition to the muffin. My score- perfect 10!!! Thank you for the kind comment Kathy! Glad you enjoyed them.